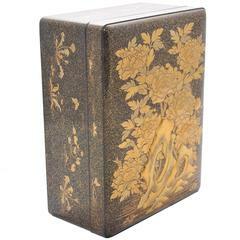 A beautiful early-mid 20th century Japanese lacquer box with design of scattered fans. A wonderfully expressive massive red lacquer box, Japanese, in the shape of a fish. With line details in gold. 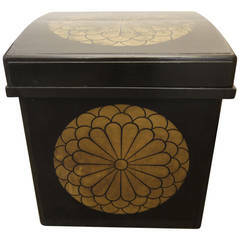 A large black lacquer Japanese antique storage box with lid. 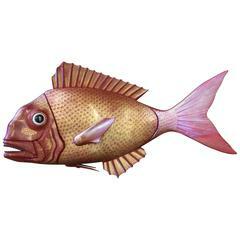 There is a large, bold gold family crest on the top and two sides. Lid has a slightly curved shape. 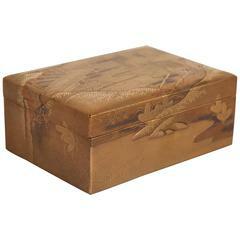 Japanese Edo period box with very finely rendered scene. 18th Century. 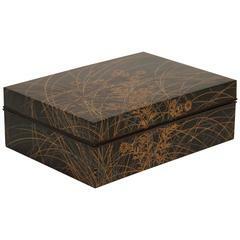 A Japanese Kobako box of Makie lacquer with the elephant mark of Zohiko Co. Decorated with a gilt motif of grass and meadow flowers. 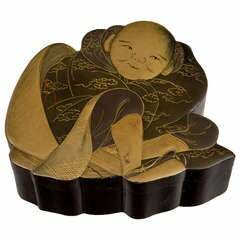 Japanese black and gilded lacquered box in the form of a small boy wrapped in silk robes, the bottom of the box and inside are speckled with tiny dots of iridescent orange.